As a change to custom, we have an original camp report was originated by Mr Puran Tharu, the CEO of the BRINOS Ear Health Community Service (BEHCS). Thus it shows things with a little more interest from the local viewpoint. We also have an account by Rory Herdman, the BRINOS Camp 59 Leader. The British team were surgeons Rory Herdman (team leader), Ian Bottrill and Matt Clark. The anaesthetist was Kumar Panikkar and the scrub nurses Alison Wrigley and Sue French. Dr Rishi Bhatta, an ENT surgeon from Nepalgunj, was able to join us for the second half of the camp. Also, Neil Weir, whose vision the hospital was, joined us in theatres for the last few days. We were also joined by Edward Rapley, who has gained a place at Exeter to become a mature medical student. 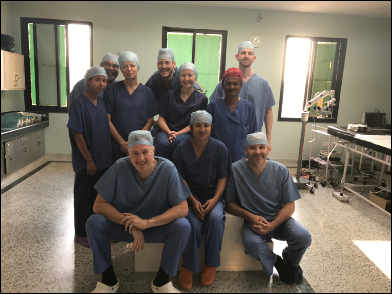 The team was ably assisted by the staff of the Ear Care Centre with some of the community ear care assistants (CEAs) scrubbing up and assisting the surgeons. We normally fly to Kathmandu then onwards after staying there overnight. This time we flew to Delhi, then on to Lucknow, with a view to driving the four hours through northern India ,across the border, the on to Nepalgunj, about 6 kilometers north of the border. This would have worked well but for two snags. The first was that a few days before the Indian government invalidated all 500 and 1000 rupee notes, in a bid to fight corruption, because it is thought most black market money is held as cash in large denominations. That meant that the largest currency notes were 100 rupees (about £1.20). Cash machines and money changers ran out of money within about 24 hours, just as we arrived. The second issue was that when we arrived at the Indian/Nepali border there was a long queue of traffic and we discovered that the local Maoists had declared a bandh. A bandh forbids all vehicles from moving and shops from opening. It brings the region to a standstill. The local population takes heed of this for fear of retribution if they ignore it. It is a show of power by the local Maoist group to the Maoists who run the country (different groups). The local groups have, in the past, been benign to us because they know that we are there on a voluntary basis to help the local population. Luckily, Rana, Candy’s ever resourceful guest house manager, had managed to commandeer two small electric rickshaws and was waiting for us at the border. We transferred all our luggage and surgical kit onto the two rickshaws, climbed in among it, and set off on an overloaded slow journey along deserted roads into Nepalgunj. The new theatre has three operating tables in the one large room. We had one for general anaesthetic cases and the other two for local anaesthetic cases with a minimum lower age limit of 13 (unlike in the UK where ear surgery is rarely performed under local anaesthetic for adults, let alone for children). Madam Storz of the Storz surgical company had kindly donated a full set of endoscopic ear surgery equipment including the video monitor. This was therefore the first camp in which endoscopic ear surgery, led by Matt Clark, was performed. This surgery is gaining popularity around the world as it can be performed with minimal external incisions and good visualisation of areas that are not always seen with a standard binocular microscope. This was our team’s first camp in the new Ear Care Centre. It is worlds apart from our previous facilities. The theatres and wards are lined with Indian marble (this being one of the cheapest construction materials in Nepal). This gives a modern and plush feel to the buildings and is also easy to keep clean, important in a hospital environment. The scrub nurses now have clean, marble clad, rooms for supervising instrument cleaning and laying up theatre instruments. Those CEAs who were not assisting in theatre were organising the pre-operative examinations and hearing tests for the patients for the next day's list and helping with post-operative patients. As usual we stayed at Travellers’ Village, a guest house run by Candy, who was an American tour guide for the Far East, until she met and married a Nepalese tour guide and set up the guest house, Travellers’ Village. BRINOS has been staying here for about 20 years so we are like family, as they are to us. Candy’s team cook a mixture of Nepalese and western food, her lemon meringue pies are legendary! 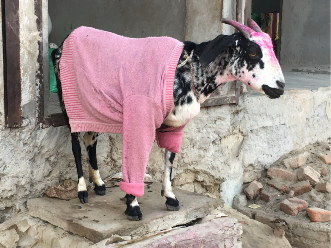 We are normally woken between 5 and 6 am by a call to prayer, exalted by a muezzin from the nearby mosque, or the bugles from the Police training camp next door….provided the dogs, cockerels, Tata truck horns or neighbours clearing their throats have not beaten them to it. After a 7 o’clock breakfast (Candy’s ranch style option available) we set off, mainly on bicycles, for the Ear Care Centre, which is about a 20 minute ride away through the rural suburbs of Nepalgunj. Traffic rules are fairly straight forward, the bigger your vehicle the more you make the rules. It is always fascinating to see the town waking up, going from the more rural part with shanty type huts with grass roofs and dung drying out on them ( for fuel), then past the new glass and steel buildings as the modern world starts to change the nature of the area. The excitement this time was that tarmac has been put on some of the roads and one of our favourite large potholes, which has previously rearranged the anatomy of one of our bikes and claimed assorted parts of the skin of one of the team members, has been covered over. This pothole was on a busy, unlit junction, and the trick was to swerve around the traffic, including free roaming cows, whilst remembering there was a pothole, invisible in the dark on the way home, waiting to claim us just as we relaxed on the quieter rural road. The pre-op ward round is held at about 7.40 and then on to the theatre for an 8am start. The patients for the day have already, by then, arrived and changed into their BRINOS theatre gowns. Surgery goes on continuously until about 5.30, although finishes when last patient is through which may be up to 7pm. Meanwhile whoever has finished operating does the post-op ward round and then goes downstairs to the new outpatient area where the next day’s 17 or so patients are examined and discussed. This is educational both for the CEAs, the Nepalese surgeon and also the UK surgeons who get the chance for lively debates amongst themselves about surgical options and techniques. The clinic finishes about 7.30 then back on bikes, past the cooking fires and off to Candy’s for 8.15 dinner, beer and bed. Then repeat….until the 110 or more major ear cases have been operated on. 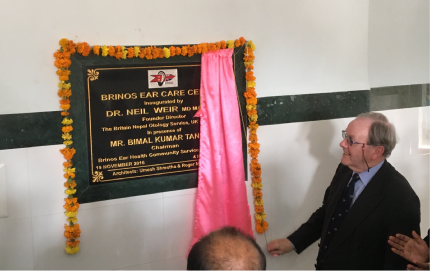 During this camp Neil Weir formally inaugurated the hospital in a ceremony attended by representatives of the BRINOS Ear Health Community Service (BEHCS), BRINOS’s sister NGO that has been given the task running of the Ear Care Centre, and doctors from the local teaching hospital, as well as local press. The aim of the Ear Care Centre is twofold. Firstly it acts as a base for the CEAs to provide diagnosis and treatment for hearing loss and ear disease in the Banke district. This service includes audiology and the fitting of hearing aids and the selection of those patients who require ear surgery. 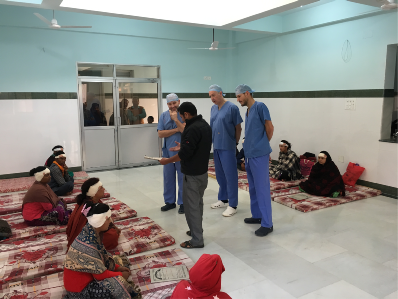 At present the majority of the surgery is performed at the twice yearly BRINOS Ear Surgery camps but since the beginning of this year Dr Rishi Bhatta has started Saturday operating lists. Secondly the Centre will act as the hub for primary community ear care in more districts of the western part of Nepal. 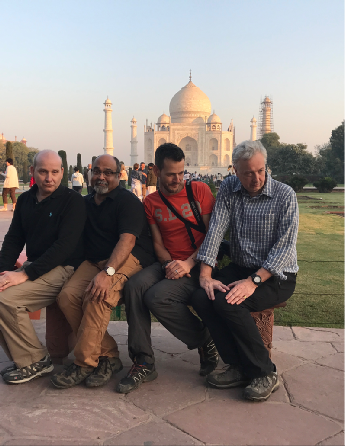 After the camp the team hired a driver and van and drove into Northern India for three days R and R… this included visiting the stunning Taj Mahal and other beautiful ancient monuments and forts. The contrast between the abject squalor of areas that we drove through and the wealth, as we drove on to Delhi, was difficult to comprehend. Notice the “beds”. These are right for the job, and along with five normal hospital beds, they make up the hospital quota. What difference to the old days, when “post op” was a tent in the grounds. Neil Weir at the inauguration, unveiling the plaque. Diana definitely did it better! Its a goat on the roadside on our way to work in Nepalgunj!